BEHAVIOURAL EVALUATION AND ENVIRONMENTAL ENRICHMENT IN A FAMILY OF CAPTIVE JAPANESE MACAQUES (MACACA FUSCATA) Requeijão, V. 1, Sousa, C. 1,2,3, 1 Dep. 1 BEHAVIOURAL EVALUATION AND ENVIRONMENTAL ENRICHMENT IN A FAMILY OF CAPTIVE JAPANESE MACAQUES (MACACA FUSCATA) Requeijão, V. 1, Sousa, C. 1,2,3, 1 Dep. Antropologia, Faculdade de Ciências Sociais e Humanas da Universidade Nova de Lisboa, Portugal 2 APP – Associação Portuguesa de Primatologia 3 CRIA - Centro em Rede de Investigação em Antropologia, Portugal 1. INTRODUCTION This study focus on 2 males, Elli and Bart (infant) and 2 females, Okha (mother) and Ryotsu. The two females are sisters. They live in a naturalistic enclosure. The main goal was to determine if environmental enrichment influences the behaviour of the individuals, decreasing the stereotyped behaviours and increasing welfare. 2. METHODS Observational sessions of continuous focal sampling during 66 days in three months, 2 hours a day, 30 minutes per individual. It totalizes 1980 minutes of observation per individual. There were three periods of observation: before enrichment (16 days), during enrichment (23 days) and after enrichment (27 days). 3. DISPOSITIVES OF ENRICHMENT Table 1 shows the different elements of enrichment used during the phase two – during enrichment. After this phase, the items that more succeed with the macaques were chosen and repeated and the others abandoned, as demonstrated in table 2, the after enrichment phase. Table 1 – Enrichment devices used in period during enrichment – June / July 2007 Table 2 – Enrichment devices used in period after enrichment – July / August 2007 ACKNOLODGMENTS Monte Selvagem – Reserva Animal: all team, in particular to Ana P. Santos and Manuel Luís. Figure 1 – Evolution of some social and agonistic Figure 2 – Evolution of some stereotypied and behaviour. individual behaviour. Okha Figure 3 – Evolution of some social and agonistic Figura 4 – Evolution of some stereotypied behaviour Behaviours. and others. Ryotsu Bart 4. PRELIMINARY RESULTS The following charts results from the mean frequencies of categories of behaviour per individual that change during the three period times of observation. Elli Figure 5 – Evolutionof some social behaviours. Figura 6 – Evolution of one type ofstereotyped behaviour and others. Figure 7 – Evolution of some social behaviours. Figure 8 – Evolution of some social and individual behaviours. 5. DISCUSSION AND CONCLUSION In all individuals, the most part of social behaviour increases. Stereotyped behaviours, like pacing, decreased in Elli and agonistic demonstrations too, specially to Ryotsu. Higher values in categories such as self- grooming during and after enrichment in Okha reveal that she probably felt more stressed with the new devices, reflecting that in interactions with her son, Bart. The infant, beside interacting well with the enrichments, is too young and showed not stereotyped behaviours, but social interactions increased with both females. Elli never performed social play or others similar. In conclusion, the environmental enrichment used in this study changed some occurrences of specific behaviours, reaching the principal aim of environmental enrichment: contribute to the animals welfare. 6. REFERENCES BRAMBLETT, C. (1994) Patterns of Primate Behavior, 2ª ed., Illinois, Waveland Press, Inc.. BOYD, R. & SILK, J. (2000) How Humans Evolved, 2 nd ed., N.Y., London, W. W. Norton Company: 135 - 165 CASANOVA, C. (1996) Primatologia: Sobre o comportamento e organização social de um grupo de chimpanzés (Pan troglodytes) em cativeiro, Lisboa, ISCSP, UTL. MARTIN, P. & BATESON, P. (1993) Measuring Behaviour – An introductory guide, 2ª ed., Cambridge, Cambridge University press. ROWE, N., (1999) The pictorial guide to the living primates, New York, Pogonias Press: 5-9, 119-125 YOUNG, R. J. (2003) Environmental Enrichment for Captive Anima. Blackwell publishing,Universities Federation for Animal Welfare Series. 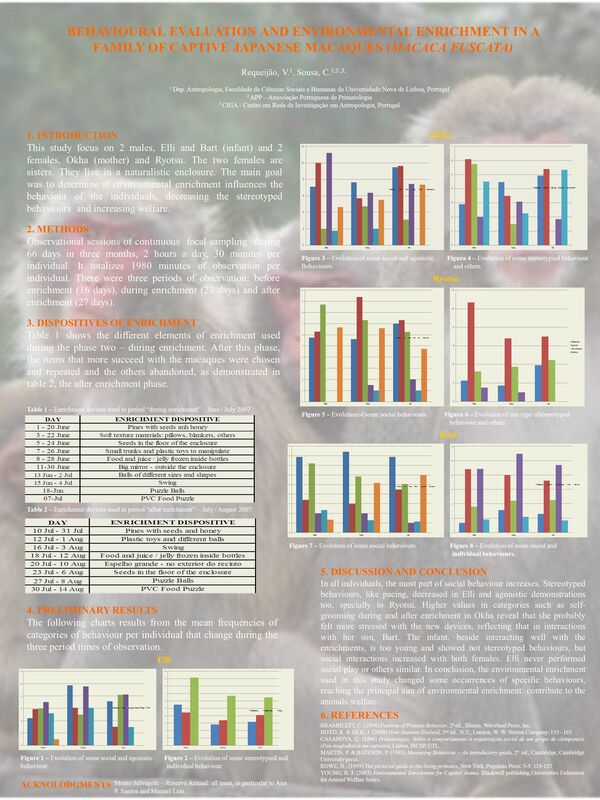 Download ppt "BEHAVIOURAL EVALUATION AND ENVIRONMENTAL ENRICHMENT IN A FAMILY OF CAPTIVE JAPANESE MACAQUES (MACACA FUSCATA) Requeijão, V. 1, Sousa, C. 1,2,3, 1 Dep." © Human Systems Dynamics Institute. 1 Finding the Fix that Fits: Human Systems Dynamics at Work November 28, 2007 Self-Organizing: Unleash the Power. Mastery Learning is a style of assessment in which the student must demonstrate mastery of the assignment by correctly answering a certain number of problems. S2: Youth Unemployment S2.1 Economic status of young men and women aged S2.2 Regional variations in unemployment and variations within regions S2.3. TIFFANY KARNEY ELENI DERESIN SPCD 505 OCTOBER 31, 2013 Case Study. 3/2003 Rev 1 I.2.12 – slide 1 of 18 Part I Review of Fundamentals Module 2Basic Physics and Mathematics Used in Radiation Protection Session 12Statistics. Atlas of the Literary Landscapes of Mainland Portugal Ana Isabel Queiroz IELT - Instituto de Estudos de Literatura Tradicional Faculdade. HCW SURVEY IN ITALY THE AIPO PROJECT FOR SMOKE-FREE HOSPITALS. 3/2003 Rev 1 I.2.8 – slide 1 of 31 Session I.2.8 Part I Review of Fundamentals Module 2Basic Physics and Mathematics Used in Radiation Protection Session. PROPAGATION, EX SITU CONSERVATION AND CHARACTERIZATION OF MENTHA CERVINA AND MENTHA PULEGIUM Delgado-Sousa,F. 1* ; Rosa, C.; Sousa,T. ; Amaro–Silva,, C.
THE EFFECTS OF FORAGING DEVICES AS ENRICHMENT IN CAPTIVE WALRUSES (ODOBENUS ROSMARUS). Sarah R. Pickens, M. Faye Parmer, Mike A. Tamborski, Eduardo J.
Penguin Personality: Rating Agreement Between Familiar and Unfamiliar Observers Jennifer Currier. Primatology. Venn Diagram Choose your favourite animal, and make a Venn Diagram about the differences and similarities between you and your favourite. Behavioral Effects of Moderate Alcohol Consumption on Non- human Primates Adapted from Shively, C., Grant, K., Register, T. (2002) Effects of long-term. 0 1 2 3 4 5 PERCENT OF TIME SCRATCHING Results Hypothesis 1: males with a shy temperament did not spend more of their time alone compared to males with.